is used extensively within Google for meetings and to collect feedback from Googlers on events or happenings within the company. It is also used at conferences and other events to organize and draw upon the collective wisdom of the participants. 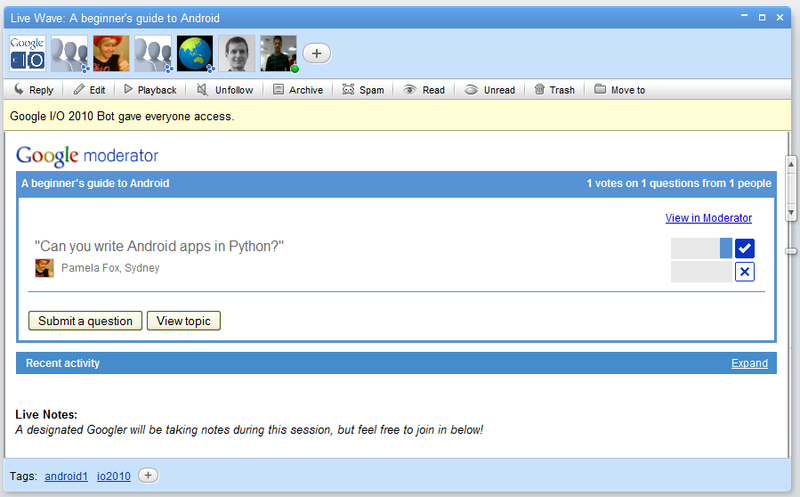 Many users have asked us for a formal API, and today, we’re excited to announce the Google Moderator API. 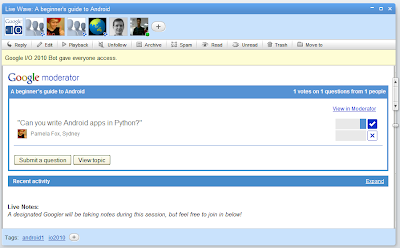 You can use the API to access, update, and participate in Google Moderator from custom interfaces. Create: You can create new series, topics, submissions, or votes on behalf of the currently authenticated user. Vote: You can allow authenticated users to vote on submissions, or to review their own votes on submissions in a series. Discover: You can retrieve topics in a series, or submissions in a particular topic or series. You can also track the current aggregate status of votes. 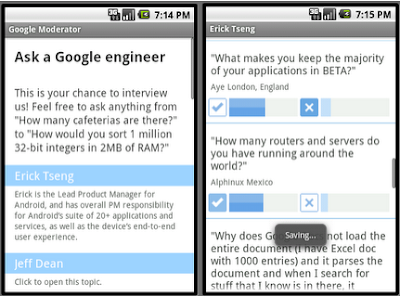 Jim Blackler, a Google software engineer, spent some of his 20% time to build Google Moderator for Android, an open source project. We’re curious to see what you build, and we’re eager to get your feedback on new features. To get started, check out the documentation and join our Google Group! Google Moderator is used extensively within Google for meetings and to collect feedback from Googlers on events or happenings within the company. It is also used at conferences and other events to organize and draw upon the collective wisdom of the participants. Nice to see there is an official one now ! No professional company should ever use Google, When you open up a developers account, what you get is a very watered down version and the accuracy is very poor , there is weak postcode recognition for the UK as they do not hold a valid license meaning that your location could be 2 roads away. My free account had no SLA and when Google did their updates, the system stopped working and they tried to get me to upgrade to the $10,000 per year licensed account. There are also issues with no support, childlike directions, bad customisation and little opportunities to export the content. @Star - there are answers to all of your issues.. you just have to know where to go and have enough experience with the tools you're using. Google and their products are awesome!